Ok, now I’m getting mad. The people who made Will Ferrell a star have no idea what they have unleashed on us all. What the hell were they thinking? Actually, it’s you I should be mad at, my dear readers. It’s you who go along in your droves and support this idiot. It’s you who have annointed Ferrell as the man most likely. It’s you. Your fault. Maybe I’m taking this the wrong way – I mean, it’s not like it’s the death of comedy, is it? Or is it? The rise and rise of Will Ferrell is a disaster of proportions not seen in my time. I mean this in all seriousness. Gone are the days when we could at least hope – albeit it often in err – for variety, ingenuity and inventiveness. Now we are stuck with the same old Will, doing the same old routine, and I envisage this extending for a long time into the future. Why do you like him? Why? Someone write to me please and explain what the appeal of this knucklehead is. 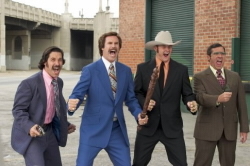 Anchorman is a tired, worn out film, without an original idea or a fresh twist. The same old gang is here, the comedy mafia – Stiller, Vaughn, Wilson – and they do the same old collection of sketches, band-aided together to make a film, with only the flimsiest of plots to hold them together. I guess the fact it was written by Ferrell and the Saturday Night Live writer may have something to do with this – Anchorman felt more like a theme show on SNL, than a cohesive feature length film. Ferrell does his usual thing, and I’m sure you’ll all love it, so God knows why I’m bothering to review it. I’m aware that at least one of our regular readers feels I never get it right about comedies, so feel free to disregard this rant as nothing more than the ravings of a misguided, deluded old man. What you all see in this loser is completely beyond me. The supporting cast is weak; their portrayals clichéd. Applegate seems lost, although the script is so poorly written with respect to female characters, one can hardly blame her. If Paul Rudd thinks this will restart his career, I hope he is sorely mistaken. This film is banal, the plot devices transparent, and the direction pedestrian. Who gave these guys the money? Oh, that’s right, Hollywood money-men don’t care if their ‘product’ is worth the film stock they waste printing it on – not if they are guaranteed a box office return. I hated this film with a passion, loathing every minute I spent in the cinema. No more than a collection of bad ideas, abysmal portrayals, and cheap rip-offs of more successful comedies, Anchorman is for all of you out there who think Ferrell is great, or loved Dodgeball: A True Underdog Story and Old School. You’re all responsible for the rapid decline in movie comedy, and we will one day look back on this time with regret.